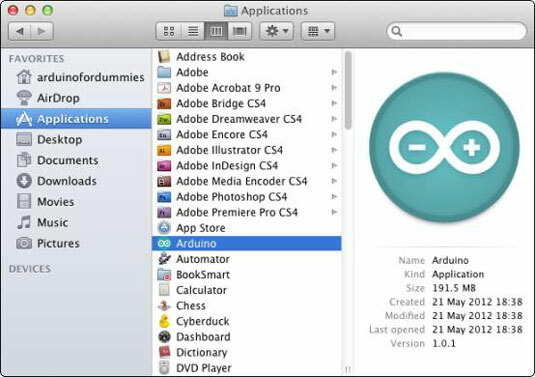 These instructions describe an installation of the Arduino Software and drivers for an Arduino Uno on Mac OS X Lion, but will work the same for Leopard, Snow Leopard and Mountain Lion. Previous operating systems may require you to search the web for your specific situation. 1Go to the Arduino downloads page and click the Mac OS X link to download a .zip file containing a copy of the Arduino application for Mac OS X. Currently, the file is 71.1MB. That’s quite a large file, so it may take a while to download. After you’ve finished downloading, double-click the file to the Arduino application and place it in your Applications folder. 2Plug the square end of the USB cable into the Arduino and the flat end into an available port on your Mac to connect the Arduino to your computer. As soon as the board is connected, a dialog box appears, showing the message A new network interface has been detected. 3Click Network Preferences, and in the window that appears, click Apply. Note that your Arduino is displayed in the list on the left side of this window as Not Configured, but don’t worry, the software is installed and your Arduino board will work. 4Close the Network Preferences window. 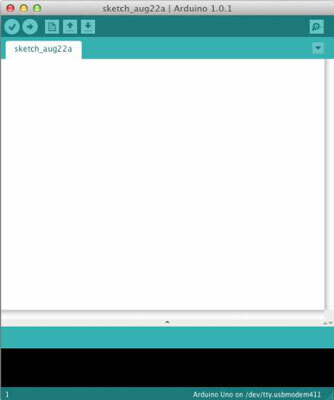 To launch the Arduino application, go to your Applications folder, locate the Arduino application, drag it to the Dock, and then click the Arduino icon to open the Arduino application. If you prefer, you can also drag the application to the desktop to create an alias there instead.